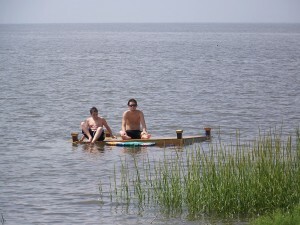 Activities at Money Island Marina are based on the season, the weather and the tides. The marina is open from March through December from 6 AM to 6 PM. Limited services may be available to wintertime sportsmen and the ramp is open 365/24 weather permitting. Wind has a great impact on boating activities. We suggest that you call Bruce before visiting to check on weather and wind conditions in relation to your planned activities. Boating: The boat ramp is capable of launching almost all trailerable boats through most of the tidal range. Do not attempt to launch within an hour of low tide. The ramp fee is $10 for members, $20 for non-members. Marina staff will help with the loading and loading of larger boat to ensure safety. 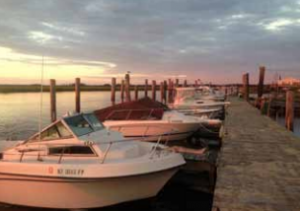 Daily or seasonal boat slips and dry dock arrangements are available. Short term slips rentals are based on availability. Rental Boats: Motorized and manual row rental boats are available for use in Nantuxent Cove and Nantuxent Creek. We have 12 foot aluminum boat with a 6 hp Yamaha four stroke engine and a 12 foot boat with a 2 hp Yamaha engine. Both are suitable for crabbing and fishing for up to 4 people subject to maximum weight loads. Please call in advance to reserve a rental boat. New Jersey law requires a motorized boat operator to complete a state-approved safety course or hold an out-of-state boating license. The rental boat agreement is available online. Crabbing: Money Island is a “hot spot” for blue claw crabs. We have a number of docks suitable for crabbing. We sell crab bait and have crabbing equipment available for daily rental. Note that New Jersey law requires a license for unattended crab traps. 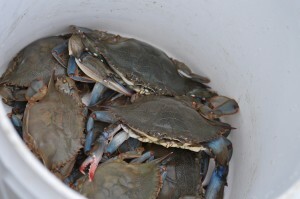 We usually have live crabs for sale in season, including shedder or soft shell crabs. It is always best to phone your order in advance. Fishing: White perch and eel are the most abundant species around the marina. Striped bass, known locally as “striper”, flounder and bluefish are the primary species sought by local boaters. Weakfish have been plentiful in the past but scarce in recent years. 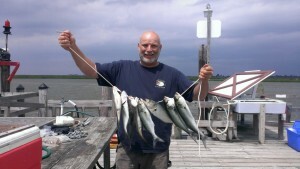 Perch are plentiful and can be caught only feet from the beaches. This is a popular activity with children but it is important to use the correct bait and fish during incoming and outgoing tides. We sell bait, fuel and tackle as well as ice to preserve your catch. Beginners may want to check this excerpt from the NJ DEP’s “Guide to New Jersey’s Saltwater Fishing“. 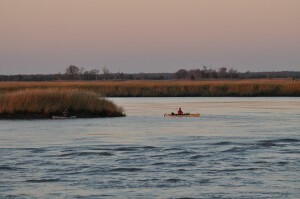 Kayaking: The New Jersey Kayaking Association named Money Island as one of the top kayaking destinations in the state. 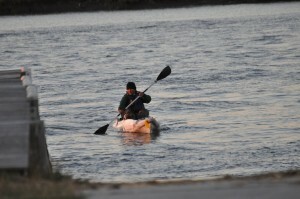 We charge $5 per kayak for the launch, parking and use of the other facilities. 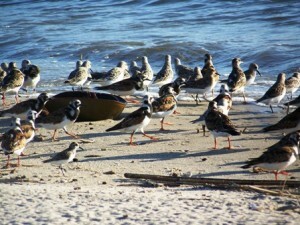 Bird-watching: The New Jersey Audubon Society lists Nantuxent Cove as an “Important Birding Area” on its Web site. Blue heron, eagles and osprey are common year round, flocks of hundred of thousands of snow geese in winter and crowds of red knots and migratory birds in the spring. Check the framed chart of local bird species located in the bait shop. Horse shoe crabs: We wouldn’t have guessed it but horse shoe crab rescues have become a popular spring and summer activity. 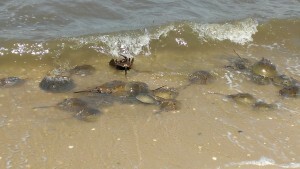 Thousands of horseshoe crabs crawl onto our beaches and roads and some, unfortunately, do not find their way beck to the water unless they happen to get a little human help. Shell collecting: Shells tend to be most numerous after a storm and are easily seen at low tide. Pet walking: Money Island Marina is recognized as a “pet friendly” business. Let your dogs run on our beach and enjoy a swim in the cove. A pet water bowl is located near the pump house and we serve pet treats at the bait house. Coffee: The marina deck is an excellent place to begin the day with a peaceful view and friendly conversation. We serve LaColumbe brand coffee, the same as served by many of Philadelphia area’s best restaurants, as a complimentary service to our guests. There is a coffee fund jar for donations to help defray the significant cost. Tipping: Marina staff are members of the company, not paid employees. Tips are appreciated for excellent service. 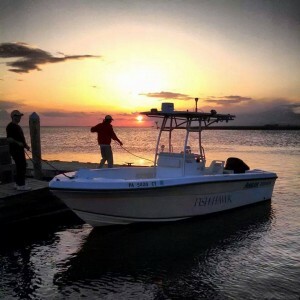 Financial Assistance – Money Island Marina is committed to ensure that financial limitations are not a barrier to enjoyment of our natural resources. If you have difficulty paying for services at Money Island Marina, including recreational or commercial fees, please ask about financial assistance through BaySave. If you can pay full rate or even support somebody else, we greatly appreciate your financial support in keeping this place open. Bugs: Bugs serve as our natural population control. Always be prepared. We sell some bug control supplies in the bait shop. Long pants and long-sleeved shirts are preferred during bug season. May flies (aka strawberry flies) begin in May. June is the worst month for bugs. Mosquitoes tend to be well-controlled when the air is moving. We keep fans at the marina deck and bait house for this purpose. In 2013 we are launching a natural (no chemical control) program to control green head flies that was tested by Rutgers University. Flooding: The road may be flooded at high tide. Water depth on the road at a typical full-moon high tide is about 6 inches and passable in a truck but may be more during spring and fall, king tides or during storms. Wading in the flooded roads has become a favored pastime among the local kids and we sell watermen’s white work boots at the bait shop. Parking: We have plenty of parking. Marina staff may request that you park in specific areas to help accommodate the day’s expected activities. Security and Emergency: All activities on the marina property as well as all road and boat traffic in and out of Money Island are recorded for security purposes. Money Island is served by the NJ State Police from the Port Norris barracks at (856) 785-0035.